"I don't know why the rotor magnets come loose. I have not seen that problem before." I have, all too often. We maintain about 20 Eigers & King Quads, and two of them have shed their flywheel magnets. Also Honda changed starter motor design for the 420 to one with "naked" magnets (previous starters had the "tin can" inside of the magnets to help hold them in place). I now have a box of 7 or 8 starters, all wrecked when the magnets fell off. They began using a similar starter on the 250 in 2006, but have now gone back to the old style starters on the 250. I have, all too often. We maintain about 20 Eigers & King Quads, and two of them have shed their flywheel magnets. Also Honda changed starter motor design for the 420 to one with "naked" magnets (previous starters had the "tin can" inside of the magnets to help hold them in place). Interesting. Have you heard anything as to why they fail? I can see why there is a magnet retainer inside the flywheel to avoid this problem. Small update, i've been comparing part numbers tonight and it looks like the 300A and B (and probably C) share the same starter sprocket(and chain), that means the crank is the same size, so there's a real good chance the B flywheel will fit at least physically. 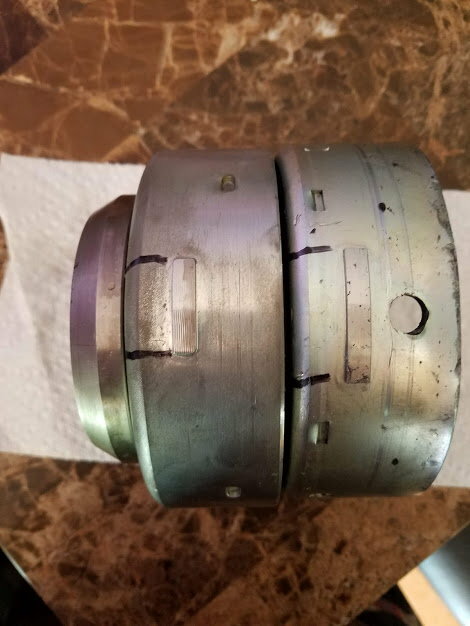 So I have on the way a B flywheel, B stator even though from what I can tell visually there is no difference between the years, same connectors, same wire colors. My stator has some damage from the magnets anyway. Even if the mounts in the cover aren't quite the same the stator can be drilled to match at least but it sure looks like it all bolts up. My experience with rewiring a few junky chinese quads might come in handy with wiring in a different stator since they did rip off the japanese ATV consortium after all. I found the flywheel key to be slightly sheared so have one of those on the way as well as a starter chain. Good to know that Honda is not infallible, must be changing of the guard in the engineering department because you would think they would have something like magnet properties nailed down by now. It would be funny if I got this going and it turned out the only real difference between the A and B charging systems was that they were made by different OEMs. "Good to know that Honda is not infallible, must be changing of the guard in the engineering department because you would think they would have something like magnet properties nailed down by now." Honda buy in starters, in fact probably all electrical components, so the faulty ones are down to Mitsuba, but Honda did lay a large egg with their products around 2005/6, as the 500 manual had a faulty gearbox and the 420 had a faulty rear axle. They fixed the gearbox quietly in 07, but the axle wasn't changed until the new model 420 in 2014. You were wise to go for both stator and flywheel. Honda must have changed both during their 300s production run, as I tried changing one and found the flywheel's inner diameter was smaller, and wouldn't go over the stator. Update time! I received a KLF300B flywheel/starter clutch combo and stator today along with a new starter chain and flywheel key. As hoped the flywheel and stator pretty much bolted up like they were supposed to be there. The pickup on the new stator needed some slight modification to bolt up, I had to enlarge the mounting holes and there were spacers molded into the pickup base so I had to grind the base flush to match the old one. Also as expected, the only other difference in the stators is the newer one is slightly smaller to accommodate the inner metal ring of the newer flywheel. Same number of poles, same mounting holes, bolted right up to the cover and all the connectors were the same and mounted the same. But does it work? It was pretty cold today and I could only get the motor to run with fogging oil. It sounded good when it did run and I was able to run it long enough to get a meter on the battery; stator was putting out about 13.8v or so, so that's good. Tomorrow if it warms up i'm going to swap out the carb with a new one i've had on the shelf and see if it will run any better. I don't think the timing is out because it does run, and the pickup chunks of metal on the flywheels are in the same spots. If this works, and it seems that it will, many others should be able to make the same substitution. have to be moved at least 5-10 degrees to not work. Still not getting anywhere with getting the bayou started. Today I had some time to try again, it gets a strong spark, is getting fuel, but all it will do is backfire out the intake. I of course suspect a timing issue but the flywheels are very very close in that area. I did check the static timing since I have had several backfires and the camshaft TDC mark is at the TOP mark when the flywheel key is at 12o'clock. The only appreciable difference that would affect running is the pickup trigger piece. The old flywheel trigger is a little longer on the backside of the spark than the new flywheel trigger. You can see it in the picture I attached if I did it right. The new flywheel is on the left. I have tried to run the atv with the old flywheel and it was no different, I get spark but it won't run. What's tough with this one is it all started when I tried to start the atv after it had been sitting for a few weeks. It ran fine when it was last used, so not sure when the magnet fell off and got chewed up and killed the starter chain/clutch. Good news anyway is the starter system is working great with the new chain and clutch. I have heard that the charging system is a "total loss" system in that if you don't have a good battery it will not stay running. I am wondering if the charging system(stator) is a necessary component for it to actually run. Only other thing I can think to try is to get a CDI box for a KLF300B to account for the different spark trigger. Both boxes are 5-wire so shouldn't be a big deal to swap. Thoughts? The KLF300As have a DC CDI box, and the engine will run without the stator, if the battery is good. You can also run the engine without the battery if the stator and reg/rect are working OK. Tho the latter is not recommended. The battery provides a much more stable voltage to the CDI. I spent a lot of time trying to get a substitute cheap Chinese DC CDI box to work with my KLF300A, and I never was successful. At the time, CDI boxes cost more than I wanted to pay and mine was missing. Now, substitutes are cheap. I eventually gave up and bought an old rusty OEM POS for $80, and it has worked since. I would do what you plan: try a B-series CDI. The timing and signal processing part looks to be different from the As. So after receiving a 300B CDI box and getting no further I started to go back to the basics, I was getting fuel as shown on the plug, but I noticed that I would get a strong spark but if I kept cranking it would drop out or stop completely. Thinking it was the CDI I swapped back the original one and it did the same thing, checked grounds, same thing. I found my spare spark plug and popped it in this morning and lo and behold it fired up and actually stayed running. It runs fine with either CDI, even at high revs so only difference is the connector it seems. I have to adjust the mixture because I think the intake boot was leaking and now that it's fixed the carb needs to be leaned a bit. As it is I still was able to ride up and down our long street a few times today and it ran great just a little boggy when starting out. So forensic analysis looks like my spark plug went bad just sitting, then the starter clutch died while trying i was trying to start the atv . Who knows how long the magnet issue was going on, but I suspect that magnet took out the spring that surrounds the starter clutch bits because that's all that was actually wrong with the starter clutch. Hopefully no magnet pieces made it out of the stator cavity into the main motor case. So yes, a 300B flywheel and stator are all that are needed to replace an original flywheel. You CAN reuse the pickup coil without any modifications; I did not realize until later that the harness for the stator and the pickup, while they appear to be contained within a solid rubber block, are actually two rubber blocks that had fused over the years, but can be easily separated with a razor blade. Timing marks on A and B flywheels are different because they are read from the front of the stator cover on the A, and from the top on a B. This could be problematic when adjusting valves but I think I can find TDC without too much trouble without the marks. If it's ever an issue it's easy to stamp lines into the rim of the B flywheel. Thank you to everyone for your help, I appreciate the insight, suggestions and support.